During our recent tours in north Louisiana and the Florida Panhandle, the question arose several times regarding George Rodrigue’s most popular paintings. But for the rest of us, human nature and personal taste draws us towards certain works. Like everything in life, this changes over time. Remarkably, George Rodrigue’s public changes right along with him --- although usually, but not always, running a few years behind. “Who wants a Blue Dog?” they asked him. But George remained unfazed. Much of Louisiana rejected his Cajun paintings for years. This was especially true of the Lafayette and New Iberia Cajun communities, where the people oftentimes found his interpretations primitive and insulting. This, despite the fact that George and, as first cousins, both his parents, are the definition of Cajun --- descended from four Rodrigue brothers expelled from Nova Scotia during the Grand Dérangement of 1755. Forty years after it was painted, dozens of people inquire daily within our galleries and on-line about this important and priceless painting. Yet it hung on the wall of George’s Lafayette gallery for fifteen years, much of that time for $5,000, without a buyer’s interest. 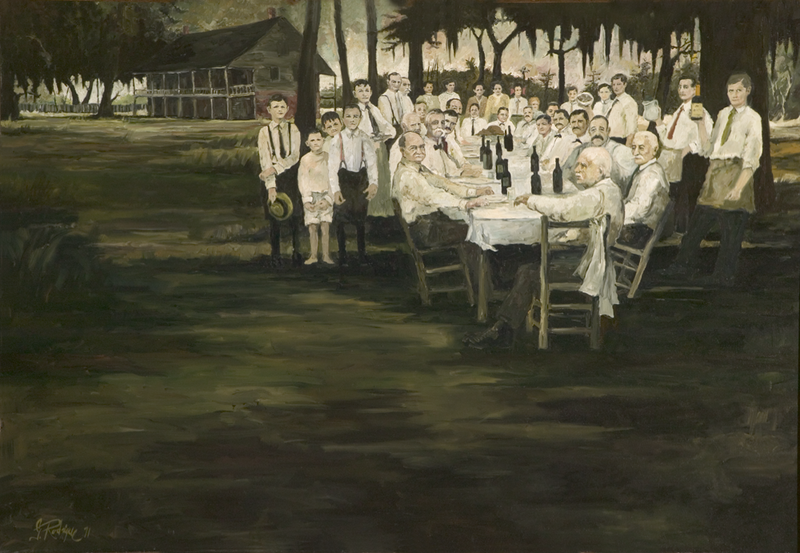 Eventually George loaned the painting to the Zigler Museum in Jennings, Louisiana where it hung for many years before making its way permanently to the New Orleans Museum of Art. There it hangs today on public view, beloved and admired by thousands. 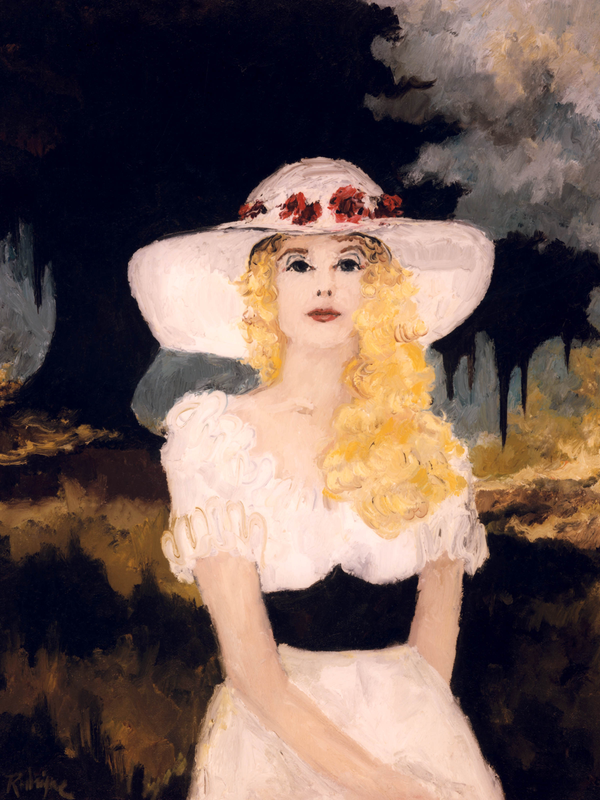 Jolie Blonde (1974, 24x18 inches) is a close second in fame to the Aioli Dinner. 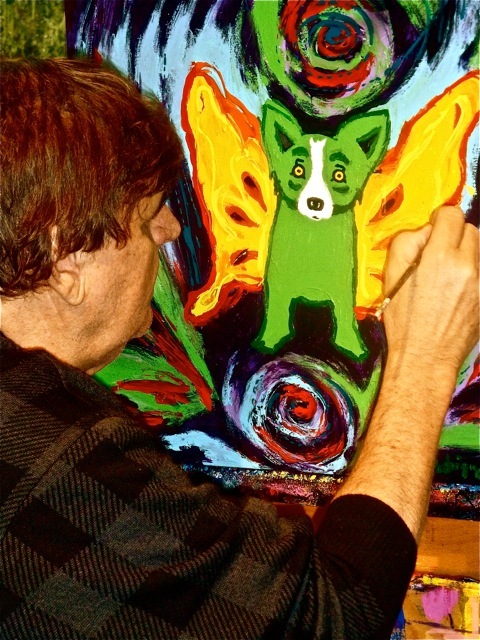 Rodrigue painted her hundreds of times using dozens of models, and he continues painting her today. Yet it is this first painting, an image without a model, created in one hour in the middle of the night and from his imagination, that remains his most famous. Like the Aioli Dinner, people inquire daily about Jolie Blonde, even more so recently, since Rodrigue’s sons opened Jolie’s Louisiana Bistro in Lafayette. If you ask George Rodrigue about popularity, he says that his Louisiana festival posters, particularly in the 1980s, made him popular throughout the state. 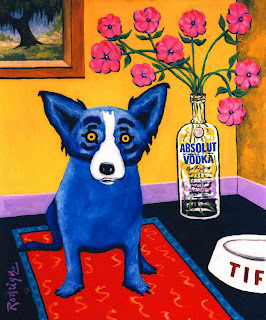 Yet it was a painting and advertising project for Absolut Vodka that catapulted his fame worldwide. 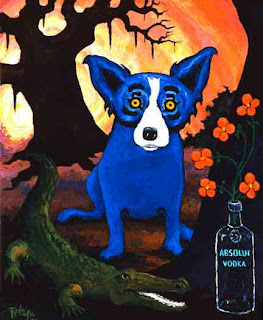 The paintings Absolut Louisiana (above, 1992) and Absolut Rodrigue (below, 1993) appeared in hundreds of magazines during the 1990s, placing Rodrigue’s art in good company, with other Absolut artists such as Keith Haring, Andy Warhol, and Damien Hirst. 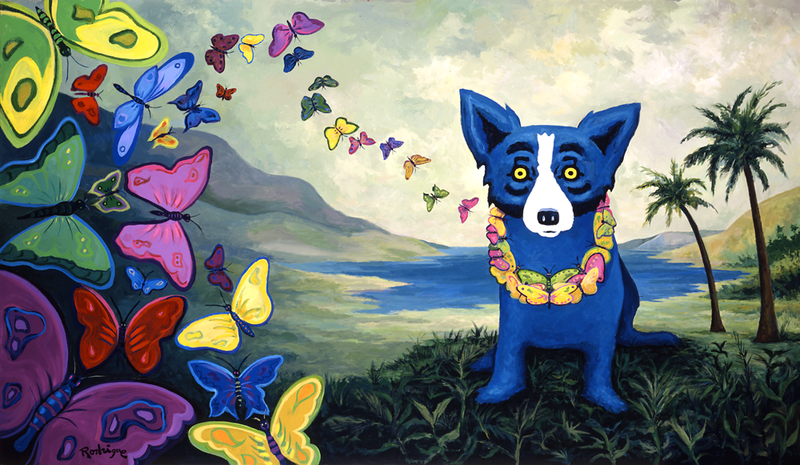 Hawaiian Blues (1999, 36x63 inches) may be the most famous Blue Dog painting. Painted for the cover of a Neiman Marcus catalogue, the image saw wide circulation in the late 1990s, appearing among other places in the windows of the department store’s Honolulu, Houston and Dallas locations. The painting has a lengthy and fascinating history that lead to other related works for Neiman Marcus, all detailed in the post "Blue Dog Man, 1996-1999." 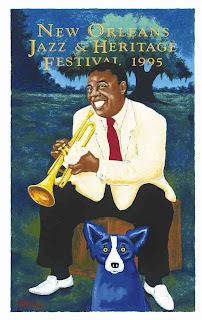 Rodrigue’s prints, too, are worth mentioning, including his highly successful Jazz Fest posters, God Bless America following 9/11, and his post-Katrina silkscreens. (Please follow the links for images and background). George replies, “The recent ones.” And he’s correct. I’ve seen this phenomenon repeatedly during this year’s museum tour. With the Blue Dog on their minds as they enter, people stop and, to their surprise, usually pause with interest at the soulful, rich early landscapes and Cajuns (see links to the right of this post), but only when forced by determined docents. Although waiting for the Blue Dog, they pass the early Blue Dog works with barely a glance, once again corralled by docents who catch people’s attention with phrases like ‘first Blue Dog painting’ and ‘notice the red eyes.’ Painted just prior to George’s switch from oil to acrylic paint, these images, so shocking when first painted, appear muted compared to later canvases. Paintings from a decade ago, such as Hawaiian Blues mentioned above, draw more attention today than Blue Dogs from 1992. However, even Hawaiian Blues lacks the ‘Wow’ factor that stops people in their tracks at the New Orleans and Carmel gallery windows. 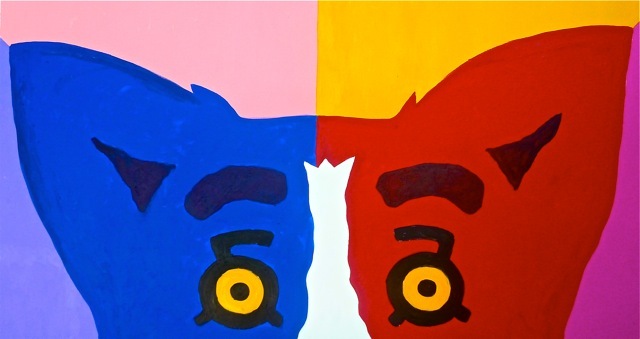 Approaching the end of the museum exhibitions, people gasp at the new works, giant canvases (such as What’s Coming Over the Hill?, 42x78 inches, pictured below) in near-electric primary flat colors, broken down into simple and strong shapes. Somehow George’s audience has grown and changed along with him. It’s an enigma, really. George has never competed with other artists nor followed a trend. 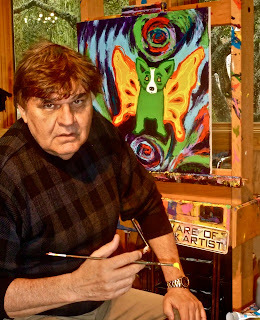 He has painted since childhood by himself, both literally and figuratively, creating in his own direction, so that he remains unpredictable.